The Consent for Use of Restraint(s) form is helpful for pediatric and general dental offices when treating children, or when treating patients with a mental or physical handicap. 100 forms per tablet. 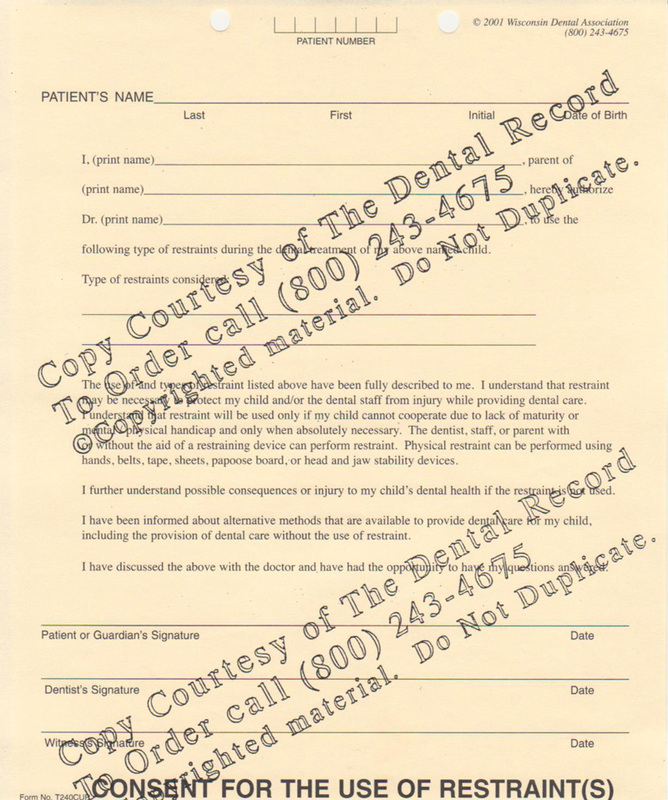 This form may be helpful for pediatric and general dental offices when treating children or patients with a mental or physical handicap. It may be necessary to physically restrain the patient. This may be done for the safety of both the patient and the dental staff. Prior to restraining the patient, it is suggested that the parent or guardian of the patient sign a Consent for the Use of Restraint(s) form. The form is a fill-in-the-blank-space format. Complete the form by providing the appropriate information in the spaces provided.